You're doing great. Thanks for helping out the community. That's a lot of unbundled. 11 unowned, not that bad I guess. Why Crankies is 6 separate games, I have no idea. But i guess 1.5¢ per +1 is a pretty good deal, for people who are into that. It's actually 7, there's also one called "Freebot Assembly" that is free. But that doesn't come close to Trivia Vault, which has now been released 32 different times, with 4 more on the store and pending already. how did you calculate the card farming profit? Lex's chart maker has this feature, however the card profit is not actually accurate since there will soon be an influx of cards on the market for these games and the prices will drop substantially. The chart has that option. But the prices will be crashing now that the bundle is out. This equates to an average card price of $0.043. For cards costing $0.22 or less, it estimates the profit to be the price minus 2 cents, so average profit per card is $0.023. Multiply by the 5 cards you receive and the script estimates you'll get $0.11 from farming Pain Train. For cards with few market listings or outlier prices, the script will fail miserably. Already own everything (mostly thanks to VT publishing generating tons of 90% off coupons back when that was still possible), but the bundle is pretty great value if you don't. Worth noting that this bundle gives 150,000(!) "achievements" just for opening and closing each game. And it doesn't even contain VT's full catalogue! this bundle gives 150,000(!) 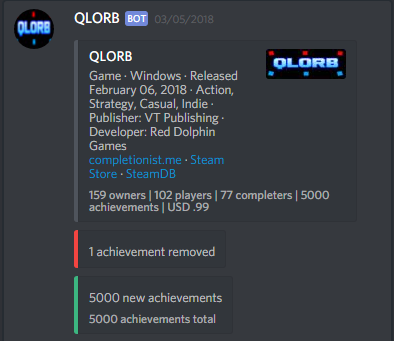 "achievements"
VT have slowly been going through all of their older titles removing every single achievement and replacing them with 5,000 that pop immediately. Most of the 24 you counted (I think all except the two Math Challenges, Digit Daze, and Depth Siege Atlantis, which all launched with 5,000) have already had this happen to them, and used to only have a single achievement. For the rest it's only a matter of time. Was missing 16 games from this so ignoring the couple with higher prices this cost me more or less the same per game as I was paying when the coupons were available. Thank you for the chart! The math speed challenge might actually be kind of fun...been meaning to write my own program for that sort of thing for a while now. Maybe I'll pick it up separate since don't care about the rest of the bundle. Although considered as not bundled, majority of this "games" (all of 'em?) had 90% off coupons on steam. Bundle like this is one more reason not to waste money for +1's even if they are 90% off on steam, nor to craft badges outside of summer/winter sale. Probably only about half of them, a fair number of these games were released after Valve neutered the coupons system by only allowing them to drop if the discounted price of the game was $0.99 or greater. Since none of these games cost above $9.90, none of them have been able to drop 90% off coupons since that change. Really that's the biggest reason not to craft badges outside of sales: 90% off coupons are still pretty great value, it's just that you can only get them for about a tenth of the games on the store now, and are far more likely to get 33% or 50% coupons than ever before. They are all repeats here. Why doesn't ITAD pick them up? Not bundled before but most probably because I bought them on Steam prior to this bundle. Here's to another 14 years of growth. You'd for example say "here's to another 14 years!" like a toast, or "have fun collecting for another 14 years". Thanks for the chart dys :o. This bundle is basically free if you can GroupBuy it and sell your cards, but even then....Nope i will pass and not let the demonic word free trick me this time 😇. Cheers for the chart dys but this is not a bundle I would buy. I don't even had to open and close them to get those achievements. That just redeeming the games seemingly unlocked the achievements (which i didn't know what possible). b) counts them on your profile page. There is a number of games where there's a visual bug in the library, I have no idea at all what causes it. Check with the API / AStats / similar.